SMS Censor does exactly what its name suggests by allowing users to censor outgoing SMS messages, giving the jailbreak tweak a set of words to watch out for. When the chosen words are typed into a new SMS and the writer taps the ‘Send’ button, SMS Censor will prevent the message from being sent and will also display a pre-definable warning message to boot. The tweak, which is available to download via the jailbreak app store, Cydia, for $0.99 works with the Messages app that comes built-in to iOS devices. Unfortunately, users of third-party SMS apps like BiteSMS are out of luck, with those users having to simply rely on self-restraint to ensure they don’t go sending inappropriate messages to their Mother-in-law! Setting SMS Censor is a trivial matter. Once installed, the tweak can be activated via the Settings app, and this is also where the tweak’s own settings are located. Here, users can choose which words are deemed as ‘banned’ as well as having the option to type in the message which will pop up if a word is detected, and the message is blocked from being sent. SMS Censor also has an option which will pop up a prompt before each new SMS is sent, asking the writer whether they want to send it or not. This could definitely come in useful if you’re the kind of person who likes to fire off SMS messages after a few drinks of an evening. Are you really sure you want to tell your boss what you really think of them? No, probably not! 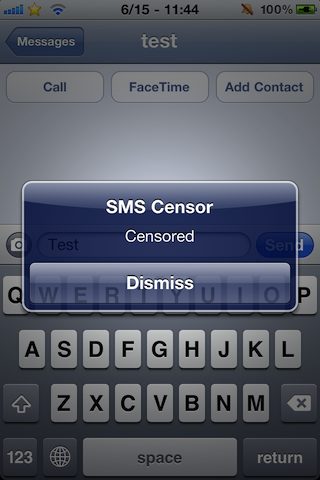 While we like the idea of SMS Censor tweak, and the option to require conformation before sending an SMS is welcome, we’re not really sure how useful the censoring part of the tweak would work. The settings for the tweak require no password to access, meaning that it can be turned on and off should anyone really want to. For an tweak that could come in useful for kids, it is all too easily bypassed. We would also like to see it block incoming messages, or perhaps alter the message before it is shown to the recipient. That said, SMS Censor does what its developer says it does, and if you’re looking for an app to censor outgoing messages, then this may just be it.